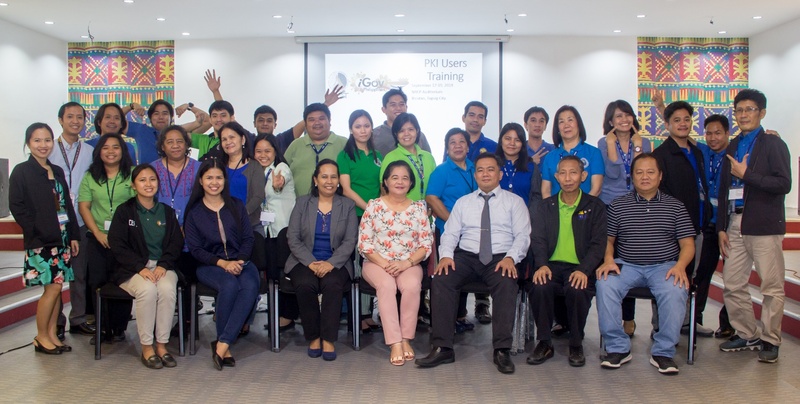 The Secretariat of the National Research Council of the Philippines (DOST-NRCP) finished a training course on the essentials of public key infrastructure, by the Department of Information and Communication Technology (DICT), which currently operates the Philippine National Public Key Infrastructure Certification Authorities (PNPKI-CAs), Wednesday, 19 September 2018, at the NRCP Auditorium in Taguig City. A team led by Mr. Deo Pedrosa, Training Specialist of the Digital Certificate Division of the (DICT) Cyber Security Bureau, facilitated the three-day training, which consisted of end-user tutorials and the issuance of individual digital certificates to the NRCP employees. The staff was also oriented on digital signing, email encryption and authentication through the use of PNPKI CA-verified digital signatures, to better ensure the security and authenticity of online data exchanges and transactions. One of the core services that originated from the iGovPhil program, the PNPKI aims to enhance service delivery of government agencies to various clients through verifiable ID. It also offers crucial protection against unauthorized access of common communications. "I am happy that NRCP is setting the tone in embracing this technology, in cognizance of the need to ensure security of documents sent through emails," said Dr. Marieta Bañez Sumagaysay, NRCP executive director.